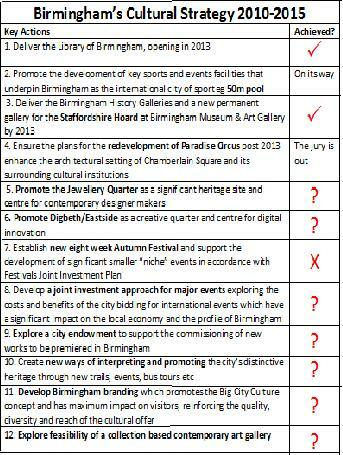 Birmingham Cultural Strategy Consultation is out. Details of it can be found on the Be Heard website. The strategy consultation finishes shortly – so get your comments in asap. Here are my thoughts – in brief. The key themes of the strategy are listed below – and actions and outcomes are noted for each theme. Let Start with what is right with this draft strategy. The importance that the City Council has placed on involving the cultural sector is to be welcomed. Each of these themes have been worked up by groups of partners. It is also clear the the Council sees this as a strategy for the whole city and all its organisations not just the Council- which again is to be welcomed. I would like to briefly focus on what seemingly is missing at present in the draft strategy. For any strategy to be successful one needs to ideally look at the one it is replacing and assess what has worked and what hasn’t worked. The achievements of the previous one, from 2010-2015, – which can be download here – needs assessing. In the graphic below I have taken a list of some of the actions and put down against each of them whether it has been achieved or not. Most I don’t know. I show this because it is only by reflecting on what has worked and hasn’t worked do we learn. It is hard to tell how well the final strategy will be written up – but as well as a review of the previous strategy there needs to be a serious analysis of the resources available from the key players – the Council and the Arts Council are fairly clear that they will suffer further cuts. Indeed the Arts Council is currently asking Arts Organisations to envisage a 40% cut. So various scenarios need planning for. The analysis of funding sources as contained within for instance Birmingham Connected White Paper is to be praised and its approach should be emulated. 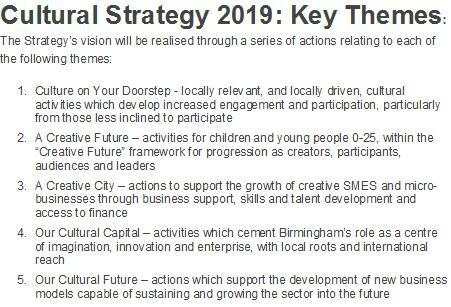 It is good that this is a strategy for the City – I assume therefore this has the Arts Council sign up to it. If the Council and Arts Council can work in consort there is still some hope. What is also needed however in the broad statements of intent that currently populate the document – is what specifically can the Council and Arts Council offer in such straightened circumstances. The document has a lot of ‘we will do actions’ – wherever possible however it needs to be clear where the monkey sits – who will lead on the action. The Council for instance should list – aside form the revenue resources – it might have remaining – the tools it might be able to use to help Arts organisations identify new sources of funding. For instance will the Council be able to give loans to organisations that have a proper business model- to enable more commercial operations? It does this for other sectors so why not the Arts? Can the Council support the accessing of crowd funding and CSR support. Certainly this level of detail on how these two organisations working together can empower the sector is not there yet. Lets hope it is in the final document. More detail on thoughts about the how and the what would be good. Will they be asking developers for provision of space for Arts organisations. We want to see a growth in the Arts similar to that that has happened around St Pancras in London and it needs planning for. What is good is the document refers to the ask of Central Government in the devolution discussions for centrally held collections (and revenue) to be devolved down to the West Midlands Combined Authority. Does the Council have any views on the nature of the collections that could be devolved. I have often felt that a partnership between Birmingham and the Victoria and Albert museum around photography could reap huge benefits for both parties and increased visitor numbers for the city. This might help in some small way to counteract the ruinous cuts to the back room expert staff at the Library of Birmingham. So to summarise – I am not going through the actions and outcomes proposed for the strategy but what I feel it needs is a review of the previous strategy; an honesty about revenue resources available going forwards and a commitment to explore other areas that the Council (and Arts Council) could develop to make up for the rapidly diminishing revenue funds. Without this – it might just appear like a series of wishes – not grounded in the reality of where we are.